“The average number of spiders a person eats in a lifetime.” is one of those things I really didn’t need to know about. This is the same category as the number of rat hairs legally allowed in a hot dog and the true composition of dust. If you’ve ever breathed on a spider, you’d notice it cowers and tries to get away. Spiders won’t crawl into your mouth if you’re breathing. Phobias are usually irrational. Clearly, they also make you do irrational things. I agree. Certain things, I just don’t want to know. smells are created by microscopic particles floating through the air, which are then inhaled, and react with olfactory receptors, which send signals to the brain. so next time you smell something bad, remember that microscopic pieces of it have already entered your body and a few of them are likely lodged somewhere inside you where they will remain indefinitely. On the comic, all that matters to me is that biff must have a special oven that can make a cookie cube and I want one….making a cookie like that otherwise just isn’t going to cook the middle properly…maybe some kind of modified kiln…? Ah, but Biff’s head occupies the middle, so you don’t want it to cook all the way through. Well, it’s well established that Biff is invulnerable. But can he also not feel pain, or not feel heat as pain? He certainly doesn’t avoid that which should cause him pain. There’s a book with such horrible things like how much excrement average human eat per year. If you see somewhere this crap, throw it far, far away. These are things I don’t have to know. You know that that is completely untrue, right? Or he could stock his room with spider-munching avian friends…. Ziriath–you didn’t have to read the book you know…. I didnt want do read it..I was travelling by bus with my class and someone behind me read the book loudly. Necro has the right of it. I think I read on snopes that a journalist named Lisa Holst made it up to prove a point about how people will believe anything they see in an email. Not to worry, the spiders statistic is a myth and househouse dust is mostly made of dirt (although still a small amount of organics). So while it is possible the dust in your house is only slightly organic, in other houses it is mostly so. Rat hairs? Why worry about that when the FDA has an acceptable amount of rat feces for your food. And now that Biff knows hes going to bake his head in an oven for 20 minutes everyday before going to sleep. @Necro Critic – That’s what the spiders want you to believe. The numbers of spiders the average person eats in a life time is greatly increased by the fact that they can be eating as survival food and are eating in many cultures. You have eaten a lot less then the average and it will stay that way. As I’m sure has been pointed out, the eating spiders in your sleep thing is a fantastic myth that everyone believes for some reason. It’s right up there with Ostriches hiding by burying their head and piranha’s speedy eating habits. More here. oh and to stephen don’t forget Quicksand being quick. Yes, the ones that make a web in your mouth are the worst! When they print the nutritional contents of breakfast cereal, they allegedly include the protein content from the estimated number of insects that have gotten into the grain before processing. Spiders? If you’re afraid of spiders, like I was, you would probably hate Monroe, Washington. There’s a forest in the foothills and the spiders outnumber the humans to the point that spiders could try trapping you in their webs. Of course, I never need to worry after finding out that fact about swallowing spiders. I’ve swallowed more than average while living in Monroe. The spiders would come into the house to get out of the rain (Monroe is a drive away from Seattle). 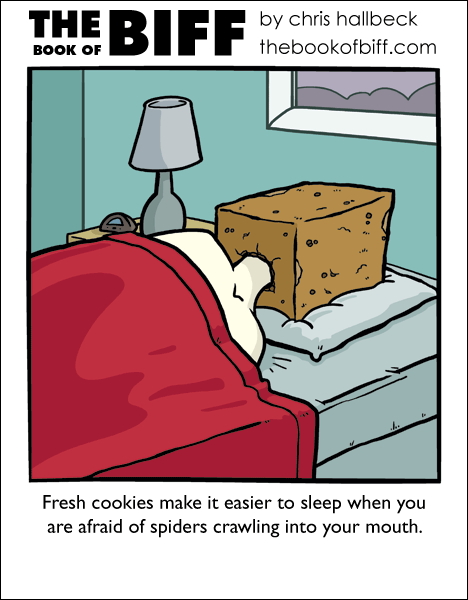 I would very much like a cookie cube to eat my way out of, even without the threat of spiders, as long as it had breathing holes or a snorkle or something. OMG! Biff has the power to breathe food!